I'm pretty sure this is Uncle Jack and Uncle Mike in this picture; just not sure which one is wearing the dress. 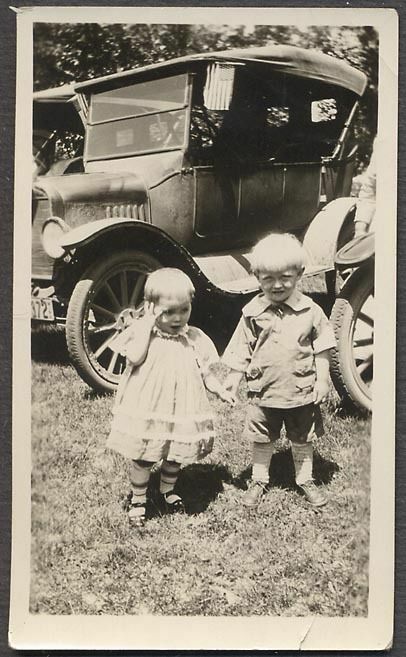 In the 1920s and 1930s both boys and girls were clothed in dresses until about 3 years old and then boys wore jumper suits or short pants. I know, I have a picture of my Dad wearing a dress when he was about 2. I remember my Father-in-Law telling me that when he was young the "men folk" were to watch after him while the "women folk" took the wagon over to a neighbor who was ill. When the women returned the men were working on a porch roof and my Father-in-Law (in his little dress) was nailed to the deck of the porch so he couldn't wonder off while they worked. Well, that must be me in the dress, since Uncle Jack is much older than I.
I hope you meant that his dress was nailed to the deck . . .
Can't be Mike,he's wearing shoes!